January 26, 2016, 12:05 PM · In an effort to promote the coverage of live violin performance, Violinist.com each week presents links to reviews of notable concerts and recitals around the world. 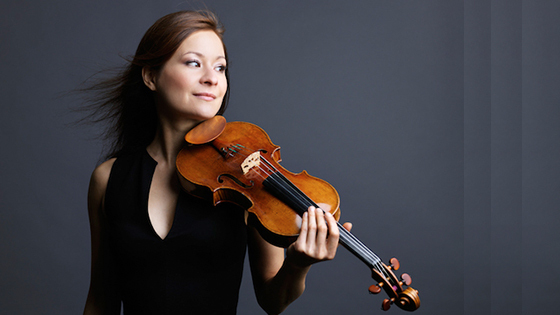 Arabella Steinbacher performed Prokofiev's Second Violin Concerto with the Singapore Symphony Orchestra. Straits Times: "Small and delicate touches, delicious little nuances of tone and colour and flashes of florid virtuosity, all combined to make this a deeply satisfying performance and one which had about it a genuinely ageless quality." Arabella Steinbacher. Photo by Peter Rigaud. Augustin Hadelich performed the Sibelius with the Calgary Philharmonic Orchestra. Calgary Herald: "...without doubt, Hadelich is an artist of the first rank, the music making superb, drawing from an admiring audience the strongest applause. The unaccompanied Bach encore served, if anything, to underscore Hadelich’s artistry: here everything was gentleness and intimacy, with the most polished technique." Pinchas Zukerman performed Mozart's Violin Concerto No. 5 with the Royal Philharmonic Orchestra. The Orange County Register: "His playing had a freedom and ease that allowed the music to bloom of its own accord. His tone gleamed with a silvery vibrancy. He shaded phrases without calling attention to himself. If, occasionally, his vibrato sounded a trifle too generous, it was no big deal. The orchestra supported him with dynamic sensitivity and nimble suppleness." Philippe Quint performed the Bruch Violin Concerto with the Knoxville Symphony. Go Knoxville: "Fully connected to (conducting candidate Aram) Demirjian and the orchestra around him, Quint's playing had a robust, full-bodied sound when the music called for it, and delicate sensitivity in the poetic melodies in the 'Adagio.'" Caroline Goulding performed the Glazunov with the Omaha Symphony. Omaha World-Herald: "...she impressed the crowd with her technical command of the work. But the sounds from her violin strangely lacked the depth so familiar in solo and ensemble violin performances at the Holland." Ju-Young Baek performed Bruch’s Violin Concerto No. 1 with Symphony Silicon Valley. San Francisco Classical Voice: "Baek’s style was full of compelling, lyric beauty, firm and gritty attacks on notes, and an impressive variety of tone." Erika Raum performed the Tchaikovsky with the Regina Symphony Orchestra. Regina Leader-Post: "Her playing was sublime at times, intense at others and full of joie de vivre. It was 35 minutes of music that came to a rousing finish resulting in a standing ovation." The Minnesota Orchestra and Music Director Osmo Vänskä will return to Carnegie Hall for the first time in five years with an all-Sibelius program that features Hilary Hahn playing the Sibelius Violin Concerto. The 2015-2016 season marks the 150th anniversary of composer Jean Sibelius’ birth. Click here for more information.